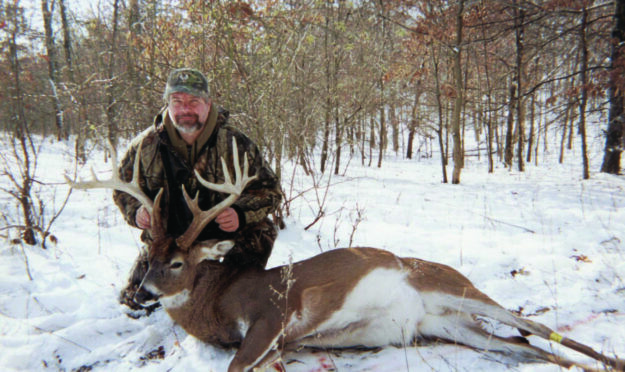 It has always been my passion to travel and hunt as many places for Whitetail deer as possible. While searching the internet in 2000, I came across an outfitter out of Fairfield, Iowa. At that time I had no idea what caliber deer were in that state, I always thought of Iowa as a place to hunt Ring-necked Pheasants. Little did I know what was in store for me. I contacted the outfitter and he informed me that Iowa is on a draw system for nonresidents and it was too late to get in for that year. So we talked about the deer he had shot and what the terrain was like, what to expect for weather and what I needed to do to get in the draw. So that following spring I put in for the 2001 nonresident deer draw and in July found out that I had drawn a tag. The following December I headed to Iowa for my first hunt during their second shotgun season. On the second day I shot the biggest deer I had ever seen at that point in my hunting experience. Needless to say, I was hooked and immediately booked my next hunt. Over the next several years I had the opportunity to harvest three more trophy deer including a 170 gross class deer (pictured below). After the last buck I harvested with a gun, it was time to really challenge myself and apply for an Iowa bow tag. Even though archery is my passion, harvesting these big bucks with a gun is just fine with me. So three years later I finally get a bow tag and head off to Iowa with a good friend, Andy O. Everyone that I had a chance to talk with said you need to be there in early November somewhere around the 8th to the 10th. I have to tell you that is most certainly the time you need to be there. I had never had such luck calling in deer using horns and grunt calls as I had that week. It seemed that every time you rattled you better be ready because something’s coming. I had multiple opportunities at big bucks and missed a beautiful heavy 8 point buck the second day there. Even though I did not harvest a deer, it was one of the best hunts I have ever been on. What makes the hunt even more enjoyable is going with someone that shares your passion and loves the outdoors. Another three years went by until I could return to Iowa, it seemed like a lifetime. The date was set the plans were made November 10th through the 16th. We had enough preference points so all we had to do was apply and wait. As always the good news arrived in July, we were awarded the coveted Iowa bow tag. From then until November the time couldn’t go fast enough. This year I had the privilege to hunt with another friend, Steve Gipp. This would be Steve’s first time going to Iowa; I was extremely excited for him. So off we went for a week of hunting the big bucks of Iowa. We encountered some weather the first day but Steve harvested a beautiful 11 point buck just a couple hours into the hunt. It was his first Iowa buck and biggest with a bow. At that point the hunt was a success, just to share that experience with someone for the first time is hard to describe. As for me, again I came up empty handed but had several encounters with nice deer. I had a chance to have a record book buck within sixty yards, that was cool and even at that distance my knees were shaking. I don’t gauge the success of a hunt by harvesting an animal but by the experience. Walking into a stand in the dark listening to the coyotes sing, the Great horned owls calling and the numerous encounters with other wildlife, and I can’t forget to mention the cows. It makes one a little nervous walking in the dark with a pasture full of cows you never know. The memories of this trip a friend’s first Iowa buck and his best with a bow will sustain me for the next three years and will make it worth the wait.